This blog post originally appeared on the National ACLU Blog of Rights. But one thing that isn't in the baby books that should join that list: Catholic hospitals. Why? Because across the country, Catholic hospitals are denying pregnant women care that is necessary to protect their health. By definition, a Catholic hospital must follow rules set by the Catholic bishops. These rules forbid the hospital from providing some reproductive health care, even when a patient's health or life is at risk. Case in point: Tamesha Means. When Tamesha's water broke at 18 weeks, long before her pregnancy was viable, she rushed to a Catholic hospital. Because of religiously based rules, the hospital told Tamesha it could do nothing for her, and didn't tell Tamesha that terminating her pregnancy was the safest course for her. The hospital sent her home twice in excruciating pain. When she returned the third time, in extreme distress and with an infection, the hospital only began to care for her once she began to miscarry. We have filed a lawsuit against the Catholic bishops for setting hospital policy that allows religion to trump women's health. And yesterday we urged the state of Michigan to investigate another situation where a Catholic hospital is putting women at risk by abruptly refusing to provide tubal sterilization to women undergoing a C-section. A C-section is the best time to get your tubes tied, and women who are denied a tubal sterilization at this hospital will now have to undergo a separate procedure, carrying additional risks, after they heal from childbirth. 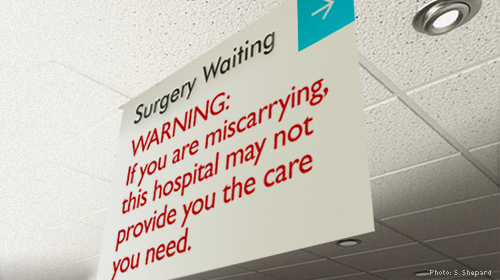 But this Michigan hospital isn't the only one that refuses to provide tubal sterilization during a C-section – all Catholic hospitals do, even though it is bad medicine. Pregnancy can be a scary time: all of those ultrasounds, blood tests, urine tests - always holding your breath for a good result. You're constantly worried about your health, and the health of your future baby. If something does go horribly awry, the last thing you should have to worry about is whether you are going to get appropriate care because of the hospital's religious beliefs. I was lucky that my pregnancy ultimately went fairly smoothly. But you don't know that it will. So in addition to avoiding all those other things – alcohol, caffeine, etc. – I made sure to tell all my friends and family that if anything happened to me, make sure that I did not get taken to a Catholic hospital for care. But that can't be the answer – in some areas of the country the Catholic hospital is the only option. Have you been denied health care? Tell us!